This Apollo 11 lunar ascent procedure sheet is being sold by Bonhams New York City on March 25, 2013, but not on astronaut Buzz Aldrin's behalf. A New York auction house is set to sell more than 300 space artifacts on Monday (March 25), including original documents that were flown to the moon and used to carry out the first manned lunar landing. But contrary to recent headlines prompted by Bonhams' upcoming "Space History Sale," the Apollo 11 moonwalker,whose lunar-traveled checklists and flight plans are being offered, is not the one doing the selling. "I am not offering any items for sale from my current collection of Apollo 11 articles in the Bonhams auction," astronaut Buzz Aldrin said in statement provided to collectSPACE.com. "The Apollo 11 items being auctioned on Monday are being resold from auctions that took place in 2007 or earlier at the instigation of my ex-wife and her daughter who acted as my attorney and business manager." 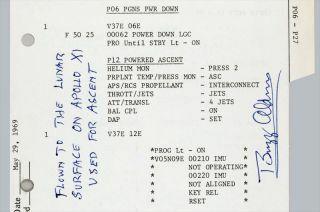 The artifacts now being resold include flight plan pages, a checklist card and the procedure sheets that were used by Aldrin and Armstrong to lift off from the moon's surface. Bonhams, which Aldrin says has acknowledged the lots in question were consigned by someone other than him, had promoted the documents' sale in a press release issued last month. "[An] extraordinary piece on offer will be a two-page entry from the Apollo 11 log book," Bonhams wrote. "Effectively equal to a log entry from Christopher Columbus' voyage to the New World ... the log pages were brought to the lunar surface in the Lunar Module Eagle on the first manned lunar landing mission during in 1969, making them the pinnacle for any space history collector." Bonhams estimated the papers would command between $15,000 and $90,000 each, depending on the document. Recent news articles previewing the auction stated that Aldrin was selling the papers himself. The reports suggested that Aldrin had put the documents up for sale after legislation was passed by Congress last year confirming that certain astronauts, including the Apollo moonwalkers, could now retain or sell the items they had used in space and saved as mementos. Bonhams' release promoted their Space History Sale as the first "major auction" since the new law went into effect in September 2012. "I have not auctioned any Apollo 11-related items owned by me for a number of years," Aldrin told collectSPACE.com. "I do not plan to do so now even though all Apollo astronauts have been authorized by law to own the items we brought back from the moon." "I have no intention of selling any more of the historical Apollo 11 items in my possession for the remainder of my life," Aldrin added. "I intend to pass a portion of these items on to my children and to loan the most important items for permanent display in suitable museums around the country." As noted by Aldrin, Bonhams' auction is not the first to offer these types of documents for sale from the Apollo 11 moonwalker's and other astronauts' collections. Another checklist consigned by Apollo 13 commander Jim Lovell to a Dallas-based auction house in 2011 was, in part, what led to the recent legislation, after NASA questioned the astronaut's title to the papers. His memorabilia sales behind him, Aldrin is preparing for the May 7 release of his seventh book, "Mission to Mars: My Vision for Space Exploration" (National Geographic) in which he details his proposed path for taking humans to the Red Planet by 2035. Follow collectSPACE on Facebook and on Twitter at @collectSPACE. Copyright 2013 collectSPACE.com. All rights reserved.